I couldn’t understand what was going on. Was I dreaming? Or was it a joke or a prank from one of the friends? “You know that for long Government of India has been doing its best to enforce good behavior across the citizens in India. You will see hoardings like “do not spit, do not urinate, do not litter” and exactly next to these warnings you will see the mess… You have anticorruption bureau, income tax departments, excise officers, enforcement directorate whose job is to ensure that all pay taxes and don’t ask for bribes – but despite the presence of these law enforcing bodies only a meager percentage of population pays the taxes and “black money” or illegal wealth is expected to be several times of the National GDP. Worse of all, those who are supposed to be the guardians of the environment, i.e. the pollution control boards and departments of environment are hand in glow with the industrialists, real estate builders and the politicians. In this nexus, India’s environmental resources are simply butchered. Worse of all, the poor and vulnerable sections of the society are affected. “I cannot stay up whole night although my students may” I said this because I remembered that Harun Al-Rashid used to roam at night in Bagdad, hence the stories Arabian Nights. “Don’t worry. We will go out this time in the day time and may be stroll nightly only for few occasions” Harun Al-Rashid assured. And we will start from tomorrow. 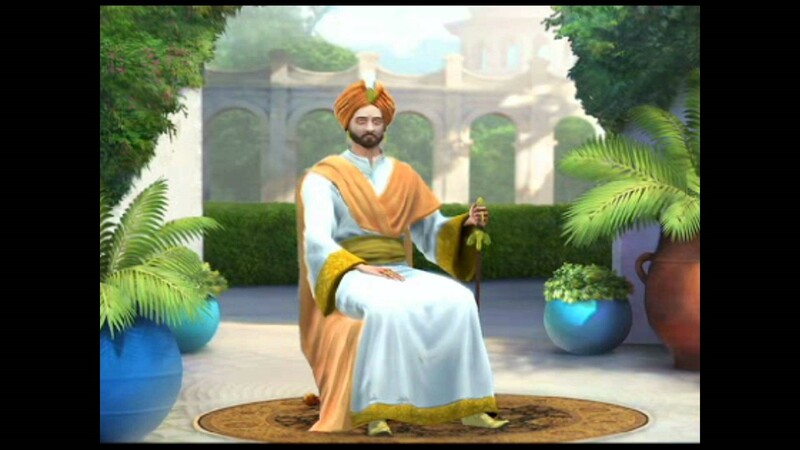 Harun al-Rashid became the fifth caliph (religious and political leader of an Islamic state) of the Abbasid dynasty (ruling family) in September 786 at the age of twenty. During his reign the power and prosperity of the dynasty was at its height, though it has also been argued that its decline began at that time. Harun Al-Rashid was very anxious that his people should be treated justly by the officers of the government; and he was determined to find out whether any had reason to complain. So he sometimes disguised himself at night and went about through the streets and bazaars, listening to the talk of those whom he met and asking them questions. In this way he learned whether the people were contented and happy, or not. Harun is the hero of several of the stories of the “Arabian Nights,” a famous book, which contains these stories. Al-Rashid was essentially a people’s person. I was wondering how Harun Al-Rashid will transform people of India who are so stubborn to change. Harun Al-Rashid explained to me his theory and the plan. It seems that a person succumbs to any habit if continued over 21 days. Say, if you want to go for a morning walk to shed your weight, then you must ensure that you take a walk every day at least for 21 days. Once done so, taking a walk in the morning becomes a habit. You now don’t need your doctor or the wife to remind you or nudge you. Now apply this theory of 21 to bad habits and irresponsible and unethical behavior. Let us assume that you tend to spit on the side of the street. Just imagine that if you don’t spit over 21 days, then you won’t spit again on the street and forever! I asked Harun Al-Rashid, but why should someone change to be good. The next day morning my doorbell rang and I saw a Social Worker with a Jholi (shoulder bag), standing outside the door. He looked like Arvind Kejriwal. I was shocked. The man said “It’s me, Harun al-Rashid and not Arvind Kejriwal. You know I always go disguised”. I thought this was a very clever and perhaps an appropriate choice. Besides, Kejriwal is known only in Delhi and not in Mumbai. We started walking on the street. Six students from IIT Bombay joined. We saw a guy who came outside his house and threw kachara (waste) on the streets. He did it so shamelessly and casually. Harun Al-Rashid caught hold of the guy and confronted him. The Man said, because everybody does this. There is a lot of litter on the street anyways. What difference will it make if I segregated waste as per the rules and put in the right bins? The municipal staff that comes to collect the waste mix all the waste from the bins and dump in the pick-up truck. The Man was shocked. “Will it be in cash?” he asked. Al-Rashid said “Yes, the cash will be delivered to you at your residence on the 22nd day” He then turned to me and said “Dr Modak, please put two of your students to track this gentleman over next 3 weeks and report”. The Man promised that he will behave good. He thought that a reward of Rs 10,000 for such a simple thing was worth. I was impressed. What a strategic approach! We went further ahead and reached the office of the Pollution Control Board. Amongst other things, Pollution Control Board’s job is to do enforcement to achieve environmental compliance. There was a discussion going on between the Officer and a Man from the industry. The Officer was asking for a bribe. The Man from the industry was negotiating an amount something reasonable. “How much money do you need?” Al-Rashid asked. The Officer said, Rs 100,000 a day. It’s not just for me. “No problem” said Al-Rashid. Don’t take bribe from any industry for the next 21 days. I will pay you in cash 21 lakhs or 2.1 million Rs on the 22nd day. The Officer was jinxed! Are you sure? he looked at al-Rashid closely – Are you Arvind Kejriwal by any chance? I am not sure you will keep the promise. Al-Rashid reassured him and said don’t worry. I will personally come to deliver the cash. The money will be packed in an imported leather bag with your name (initials) engraved on the sides as a special gift. The Officer said he will not take or ask any bribe. We continued the journey and met with a corrupt technical committee member who made money on sanctioning speedy environmental clearances by manipulating or sometimes flouting the rules. Al-Rashid fixed him by offering a hefty sum of 20 million Rs after 22nd day. Two more students of IIT were planted to monitor him. We also made a visit at night and caught Production manager of an industry who was habituated to bye-pass and discharge untreated effluent in the water course at night. He was offered a reward of Rs 1 million for not doing so for 21 days. My job was to supply students as watchdogs. I had to poach students from other institutions as I was fast running out my stock. Al-Rashid suggested that I speak to Communist Party Leaders like Sitaram Yechuri as he felt that the CPM party workers don’t have much work to do and could take up this task. I was maintaining a record of promises Al-Rashid was making. On our very first two days and one night, the total money committed to be paid crossed 10 crores or 100 million Rs. This amount was staggering. Oh, no worries. The entire project is sponsored by Mr. Azim Premji of Wipro. Premji is too rich a person, equally very generous and has a problem how to spend his money. He has earmarked Rs 53,284 crores for his foundation already to help the society – mainly supporting education. And he is the one who asked me to implement the 21 day strategy of transforming India and break the bad habits of Indian citizens. This effort is in fact equivalent to educating people. I love him. I was impressed. I now understood how we could potentially reach a new regime of self-transformed India– something that is reward driven while abandoning the traditional and ruled out techniques of enforcements and punishments. But I still wanted to put a word of caution and so I asked Al-Rashid. By then he had shed the face of Arvind Kejriwal and was back in his caliph dress – He was looking majestic. I could not disagree. Al-Rashid was perhaps right. He disappeared giving me hopes for India’s transformation. “Of course count me in – Who else is joining?” I asked with all excitement. Well Professor said “The invitations have been sent to select top honchos of India Inc. This includes biggies like Kiran Shaw Mazumdar, Naina Kidwai, N. Narayan Murthy, Anand Mahindra, Ratan Tata, Rana Kapoor and Kumarmangalam Birla just to name a few. Some politicians are also invited like Sharad Pawar as these leaders are more of business men and actually part of the industry. Don’t you know? Professor said. 247 corresponds to three scenarios of 20 , 40 and 70 rise in the global mean temperatures. The Professor then educated me on the significance of 2,4 and 7. I was always curious about Mr. Ambani’s residence on the Pedar Road. Antilia as it is called is a name given of a mythical island in the Atlantic. (Apparently this name was chosen by Mr. Ambani as he wanted to remember the threat to the islands of the Atlantic of submergence due to sea level rise). 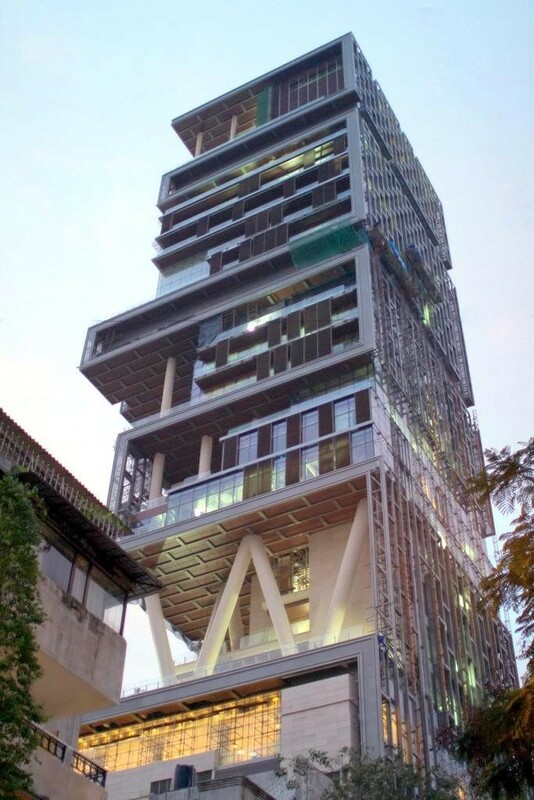 Antilia is believed to be worth $1 billion USD today and is deemed to be the world’s second most expensive residential property- after Buckingham Palace. The structure of Antlia was designed to survive an 8-Richter scale earthquake. But to Mr. Ambani, making a building resilient to the earthquake was something rather trivial. Few know that Antilia incorporates features to withstand risks due to Climate change. The risks addressed include extreme events that could happen in Mumbai such as floods (remember 2006? ), cyclones, tsunamis and the like. For Antilia, these risks were considered both in isolation as well as in combination. This feature was implemented by my Professor friend – something not even thought by President Obama for his White House in the United States. What a pity! When Professor explained, I realized why the building profile and architecture of Antilia was ugly and an eye sore as the science of climate risk adaptation and mitigation required weird shapes of architecture and absurd floor heights. For instance, Antilia has 27 floors with extra-high ceilings (other buildings of equivalent height could have had as many as 60 floors). The critics however do not understand the secret i.e. a unique risk insulation of Antilia from climate change. The report indicated that the temperatures in North India are going to be on the rise causing severe heat stress. In the 40C rise scenario, there would be 80% probability that a northern Indian would encounter heat that would prevent core body temperature from falling down to normal (i.e. 370C) during eight hours of rest at night. This would lead to affecting person’s sleapability. Such a heat stress would also mean a reduction of around 40% in the workability. Further, there is about a 40% chance that individuals in northern India will not be able to participate in competitive outdoor activities in summertime when global average temperatures have risen on average by 10 C compared to the present. With 40 C of warming, this probability will be around 80-90% in northern India. Mr. Sharad Pawar said that this would mean that the business of ICL and the likes of BCCI will be affected in the States of Punjab, Rajasthan, Haryana and Union Territory of Delhi. The Sports Stadiums constructed there will remain deserted over four to six months in the year. Further, due to the heat stress, the cricket players may not be able to meet the secret expectations of the bookies. This will lead to a loss of revenue to the Film industry. No worries, Mr. Ambani said, we will convert these sports stadiums into Solar Parks taking advantage of the existing structures and the rising temperatures. These gigantic solar parks will help meet the national energy deficit. All appreciated the idea and Mr. Pawar offered help in this transaction. I thought that was a pretty friendly gesture. Indeed, Times will make money in this process but as a principle, Arnab said that it will allow advertisement of only Low Carbon Goods and Services. Or the advertising rates of High carbon goods and services will be kept 4 times high. That principle was really laudable I thought only challenge being how to define what is low carbon. In Arnab’ s words, India will need to know. I was also not sure whether the disturbed sleep at night would happen solely due to climate change or due to listening to Arnab Goswami late at night in addition to listening to him over the day! Mr. Rana Kapoor expanded on the point of low carbon goods and services. He said that his Bank will lend money only to those enterprises who make climate friendly goods. “Yes Bank” will be recognized as “Yes and (sometimes) No Bank” when financing business that is not climate friendly. Premium accounts will be offered to citizens with higher interest who demonstrate low carbon footprint. There will an on-line carbon foot print calculator when accounts are to be opened. These strategies will distinguish the Bank from the conventional ones like ICICI Bank and HDFC and have more deposits. There was a group of industry leaders representing the refrigeration and HVAC sector. They had smiles on their faces. They heartily welcomed global warming and the climate change. Mr. Bon-Joon Koo, Vice Chairman and CEO of LG Electronics, who flew specially from Seoul said that Air-conditioning will become a defacto standard for buildings in India for the future – and even the slum dwellers will get affordable air-conditioned housing. For them the air-conditioners installed will be the second hand imported from China as China believes and practices “circular economy”. For the rich, he said that LG will come up with personal aircon costumes similar to what astronauts wear. At a flick of a button on your special wrist watch like device, you can cool your body to a preset temperature. This will greatly reduce the heat stress to the people and maintain the work efficiency even in the outdoors. There were more happy industrialists like Kiran Shaw Mazumdar who were launching in advance a range of preventive medicines that would help combat the new disease vectors arising due to rise in the temperatures. Naina Kidwai of HSBC spoke about the business of climate insurance that they will promote and Shilpa Divekar Nirula CEO of Monsanto India region talked about the opportunities to the GMO market as climate change will bring threat to food security. Anand Mahindra said that his company will produce electric vehicles 10 times of the last year to commit to the mitigation measure for Climate change and lead the automobile sector business. We want the climate to change in our favor – all of them said. When the breakfast ended and all the industry doyens left, Mr. Ambani closed the door and looked at the Professor in a deep gaze. “Have you got Jitong Wang here?” Yes Mr Ambani I have. Professor said. Should I get him? 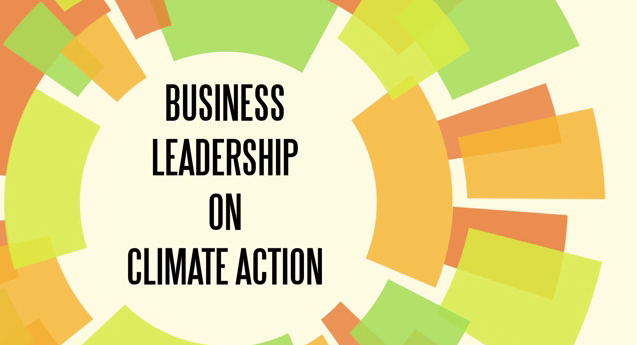 I then realized the complexity of the business in climate change. I took the elevator to the ground floor and punched 247 to exit. My Professor friend stayed. Pollution Upstream, By Products Downstream – and Who should Pay? Last week I was in the chamber of Member Secretary of one of the progressive State Pollution Control Boards in India. A discussion was ongoing to set effluent standard for COD for a pulp and paper mill upstream the water intake of a major city. The discussions centred around modelling of COD from the point of effluent discharge to the point of water intake and arrive at the COD limit. I found the discussion not focusing on the real issue. The impact of COD on the generation of disinfection by products (DBPs) leading to potential THMs and associated health risks in the water supply was completely missed out. Hence this post ….. Most rivers in India are today polluted. Untreated domestic wastes, industrial effluents and agriculture return waters have been the principal sources of pollution. Dumping of solid wastes has also been an important contributor. To top, indiscriminate withdrawal of river waters is carried out for the interest of irrigation, power generation and industrial consumption. 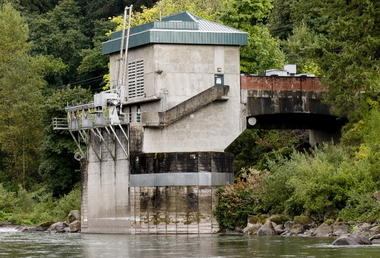 This has led to reduced river flows offering less dilution and low flushing velocities. Importance of maintaining “environmental flows” is generally discussed only in the conferences and serious attempts towards setting policies to this effect are not seen. Will we ever see? River water quality is understood through basic parameters like Dissolved Oxygen (DO), Biochemical Oxygen Demand (BOD), Most Probable Number (MPN) of Coliforms and pH. Classes of water quality are defined based on the levels of these four parameters. Water quality is considered to be Class A when DO > 6 mg/l, BOD < 2 mg/l, MPN < 50/100 ml and pH in the range of 6.5 to 8.5. Water of class A could be used or consumed with minimal or no treatment. You would hardly expect to see Water quality Class A in the river stretches of India. Perhaps, that’s a dream not to come true. So, we need to treat water before consumption for drinking. Water treatment plants are designed, installed and operated at the locations of river intakes and only then water is transported to serve the population in cities. We want water we drink to be “safe”. Water treatment plants are designed to meet the drinking water quality standards. These standards are guided by the Indian Standard IS 10500. Amongst the several parameters listed, the principal parameters where standards are specified include Turbidity, MPN of Coliforms, pH, Total Dissolved Solids (TDS), Iron, and Nitrates etc. 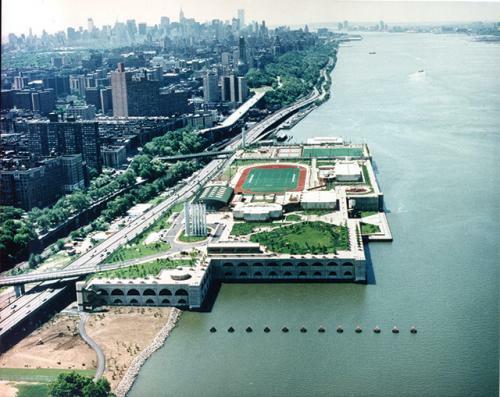 Performance of the water treatment plant depends on the quality of water it receives. Worse is the quality of raw water, more are the efforts expected on treatment of water. Dose of chemicals e.g. for flocculation and disinfection increases as pollution increases. Cleaning of the filters is more frequent generating more backwash water and longer retention times may have to be maintained in disinfection units. All this adds to the cost of operations. More importantly, since most water treatment plants are designed as conventional, several specific pollutants such as metals, AOX etc do not get intercepted or treated posing risks to the consumer. This risk is rarely understood and not adequately addressed. In some of the States in India, water intake works have been shifted “upstream” due to the problem of increasing pollution downstream. But is this way to “solve” the “problem”? Pollution in rivers has thus indeed influenced the water treatment works in India both on costs and efficiency. The risk of supplying safe drinking water has steeply increased. The true cost of not treating pollution upstream can be significant to the downstream population or the water users. Somewhere someone saves moneys and somebody else pays elsewhere! This has always been a differential, a skew and a case of inequity requiring an inquiry in the economics of environmental management. We need to take a systems perspective. Unfortunately, agencies that manage pollution do not interact with water works agencies. They need to talk and work together. Let us take BOD as a parameter of concern for expressing the level of pollution in river waters. This parameter is understood better when we connect it with Chemical Oxygen Demand (COD). Both BOD and COD are not generally measured at the intake of water treatment works. An associated parameter is Total Organic Carbon (TOC) that provides further insight. Few water treatment plants that operate sophisticated disinfection systems and tertiary treatment processes measure TOC. BOD, COD and TOC show relationships and one can set up “regression models” to map one from another when data is collected over time. 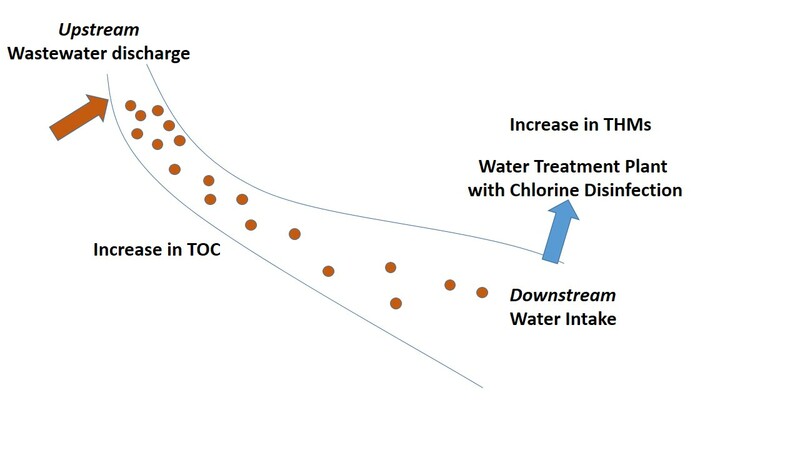 Higher is the value of TOC, higher is the dose of chlorine required in the process of disinfection to ensure destruction of Coliforms and to maintain desired levels of residual chlorine. The cost of operating disinfection unit increases as the TOC in the raw water goes up – which is the result of pollution released “upstream”. It will be interesting to see trend of chlorine consumed per Million Liters Day (MLD) and operating costs at a water treatment plant as a function of average TOC/COD/BOD levels at the raw water intake works! I wish such data is collected, analyzed and reported. The issue is however not just increase in the operating costs. A new dimension of health risk gets introduced. In the process of disinfection of polluted (high TOC) water, several Disinfection By Products (DBPs) are formed. These DBPs can pose significant health risks, especially on occurrence of cancer and lead to substantial medical costs. You should visit web page of US EPA http://water.epa.gov/drink/contaminants/basicinformation/disinfectionbyproducts.cfm# that provides information on what disinfection byproducts does EPA regulate, how are they formed, and what are their health effects in drinking water at levels above the maximum contaminant level? Chlorinated DBPs are considered potentially carcinogenic and have been associated with adverse reproductive outcomes following exposure during pregnancy. Tri Halo Methanes (THMs) are the most important group of DBPs. THMs include chloroform, dichlorobromomethane (DCBM), dibromochloromethane (DBCM) and bromoform (BF). Organic matter in natural water, expressed as TOC, is considered as the dominant THM precursor in drinking water. The World Health Organization (WHO) has set limits on THM. Indian Standard 10500 also specifies thresholds to THMs in drinking water. 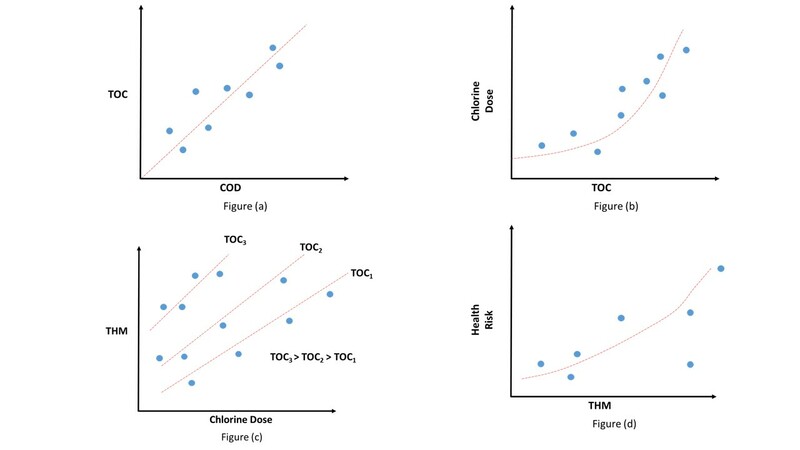 Figures (a), (b), (c) and (d) show various relationships between COD, TOC, Chlorine dose, THMs and health risks. Figure 2 below shows the “dynamics” of TOC and THMs from upstream to downstream. How much do we know about the levels of THM in our drinking water? Research carried out in India on formation of THMs is very limited and has shown mixed results when water was analyzed at the water treatment plants, at the reservoirs and in the swimming pools. There is a need to conduct THM monitoring systematically over a year, on a national basis and at all major water treatment plants. We need to understand and assess the cause that leads to generation of the THMs. Here, wastewater inventories at the upstream will also need to be carried out. Occurrence of cancer instances, especially of the bladder will also need to be looked at through community health surveys. Results of this field work must be shared with the public with a preventive and corrective plan launched. We need to seriously tackle pollution at the upstream, optimize operation of chlorine based disinfection and even think of substitutes to chlorine. We could perhaps develop a Risk Index or a Score Card for a water treatment works based on potential generation of THMs and pay for water accordingly. If the risk index is high then the water treatment plant will need to be compensated by the wastewater dischargers upstream. The Regulator will have an important role to play by slapping additional fines. Indeed, we must address the nexus of Pollution upstream and By Products downstream. We also need to raise the question who should pay? For this, the Regulators, Wastewater dischargers upstream, Water Treatment Plant operators downstream, Medical practioners and the Community must talk and come up a rounded solution. We need to look at the problem in 3600 and not in a narrow perspective of mere compliance to in-stream BOD and COD standards. 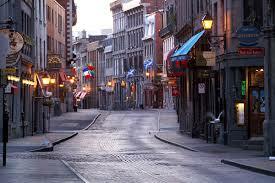 Modavie is one of the famous bistros in old Montreal. I will highly recommend. 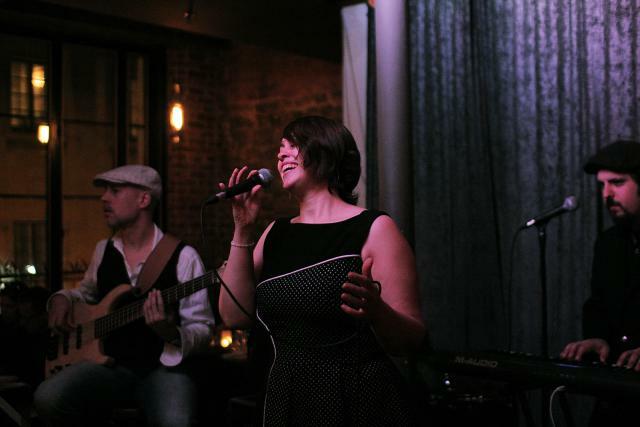 Seven nights a week, local bands take the stage at Modavie. Modavie’s spirited setting encompasses two intimate floors and sets the scene for a night of great tunes, top dining and generous pastis toasting. The bistro’s wine menu hits just the right notes. I booked a table as close to the performing area of the artists. There was a jazz music in the evening to be played by one of the “vintage artists” originally coming from Chicago. When I arrived at the Modavie, few guests were around and most tables were not occupied. But soon people started pouring in. I asked for a glass of Brut blanc de blancs – a standard stuff. As I was sipping wine and reading the flyer that was placed on the table about the artist, someone with a sophisticated cloud of fragrance passed by me. That took my attention. Wow what a choice of perfume, I thought. It was an elegant woman, perhaps in the age group of 40-45, who had taken a seat on the table adjoining me. And she was alone – like me. She was beautiful with blonde hair and blue eyes. The lady asked for the wine menu and after some discussion with the bar tender, asked for Michel Jodoin – a sparkling wine. “Oh Better choice” I said to myself. The jazz performance began. The sound of the strings on the box guitar was great and so were the voices of the two singers (the singer duo was father and daughter I learnt later). The choice of the jazz numbers was amazing too. It unfolded memories. In the short break that followed, we connected to each other with our eyes. I raised my thumb to express my appreciation to the music being played and the lady responded to me with a warm smile. The twinkle in her eyes seemed to say “ I totally agree”. The second cycle began and the artist (father), asked for requests. I wrote down my request for Autumn Leaves by Tal Farlow. I always like listening to this great number. Many sent suggestions. The lady next to my table sent a chit too. The Artist was skimming through all the requests to decide what can they play and in what sequence. After he completed his “inspection” of all the chits, he spoke into the mike- and said softly. “All very inspiring and challenging requests – in this limited time let me see what we can do”. He then paused. I raised my hand. And I was astonished and pleasantly surprised to see the lady next to my table was the second person. She waived out and seemed to like Tal’s music just like me! I said “of course” and adjusted my chair so that she was comfortable. The cloud of that extraordinary perfume got now closer to me. We listened to the Autumn Leaves together. The Artists were doing pretty well and it was an enjoyable experience. We clapped longer than others after the performance. After the close, we ordered for Coffee and got into conversations. She (Kenza) came originally from Egypt with Egyptian mother and a French father. Kenza was now a Canadian citizen and lived in Calgary. 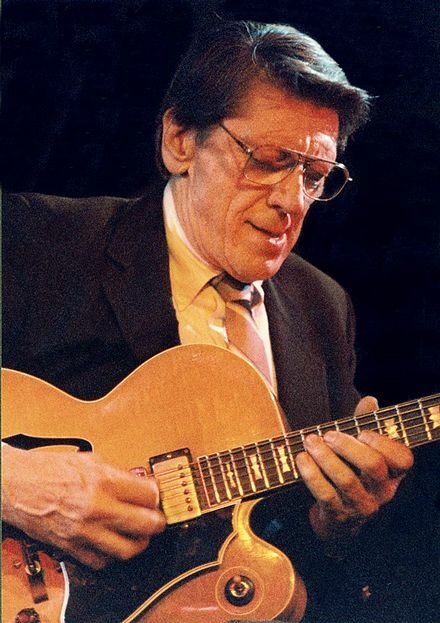 We spoke about other works of Tal and discussed about other Jazz Guitar performers. It was another stroke of coincidence that Kenza had come to Montreal to attend the same Ecocity conference that I was attending. “What a small world”, she exclaimed. We decided to catch up the next day in the conference. I said don’t worry I will. And I booked the best table possible. We met at the Modavie that evening. This time I ordered the sparkling wine of Kenza’s choice. The bar tender smiled, especially seeing us sitting together on the same table. Greg Clayton was amazing and we both had great conversations. I learnt that Kenza, an urban planner of international experience, was recently divorced, and was feeling lost and empty. I could sense that music was the best bet for her to get back to life– she played piano. We skipped coffee this time and left Modavie by 10 pm. My hotel was in walking distance, little ahead of the apartment hotel that Kenza stayed. “Don’t stay in the swanky hotels when in old part of Montreal, the apartment I stay is a building of 1904! You will live in the history” Kenza said. We started walking. The perfume was still strong in the air and in some sense intoxicating but with sophistication. I did now know what to say. I looked into her eyes. Her eyes – blue and innocent, longing for conversations and searching for a continued friendship. I adjusted her long coat as the wind was chilly. I said good bye. And the next time never came. My coffee is still pending with Kenza.